Sophomore defenseman Chad Krys broke open a scoreless tie with two third-period goals--1:37 apart--as the #12/11 Terriers snapped a two-game losing streak with a 2-0 win against #6 Providence at Agganis Arena. Pardon the headline pun, but this was no gift. The Friars opened the game with heavy pressure on BU and outshot their hosts, 11-1, in the first half of the period. Sophomore goalie Jake Oettinger stopped them all, giving the Terriers a chance to right the ship and get some attack time. At the end of the period, shots were 15-9 PC. 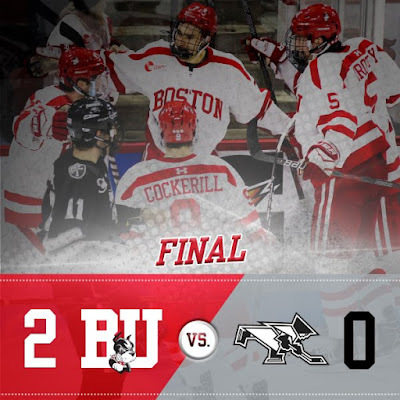 BU poured 14 shots on the Friars net in the second, aided by three power plays, as it dominated play, but couldn't put one past Hayden Hawkey. The ice continued to be tilted BU's way early in the third period with no change on the scoreboard until sophomore Patrick Harper's return pass found Krys in the left circle for a wrist shot that found the net. The cheering in the stands had barely died down when Krys intercepted a pass at center ice, carried the puck up the left side, sped past a defender, deked Hawkey and backhanded a shot home. The Terriers had several additional chances to add to the lead but were halted. Providence pressed to get on the board and pulled the goalie with two minutes left. The 6-on-5 became a 6-on-4 when Bobo Carpenter drew a penalty, but the Terriers came up with key clears to keep the puck out of the zone to preserve Oettinger's shutout. Terriers are back on the Agganis Arena ice tonight, taking on Northeastern in a 7 p.m. start. 2018 recruit Joel Farabee assisted on a pair of goals and fellow recruit Jack DeBoer contributed a helped as the NTDP U18s defeated Youngstown, 5-4, in overtime. 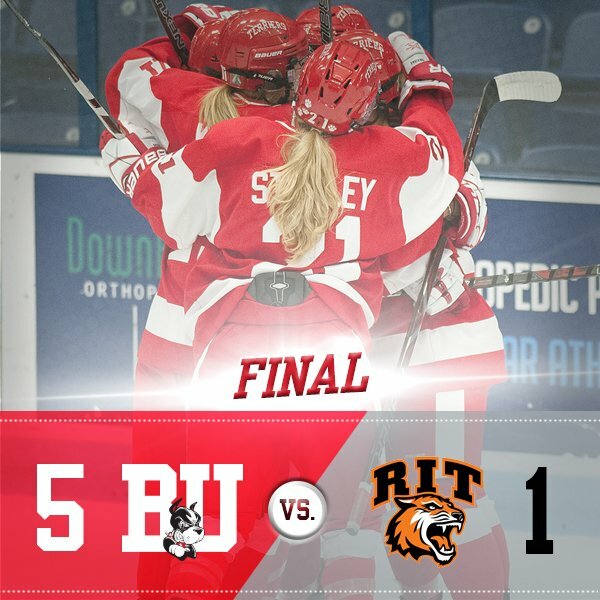 Terriers scored three first period goals and rolled to a 5-1 win against RIT at Walter Brown Arena in the first-ever game between the schools. Goals by freshman Reagan Rust and seniors Victoria Bach and Nina Rodgers gave BU a 3-0 lead. Abby Cook's power play goal just 20 seconds into the middle period stretched the lead to 4-0. 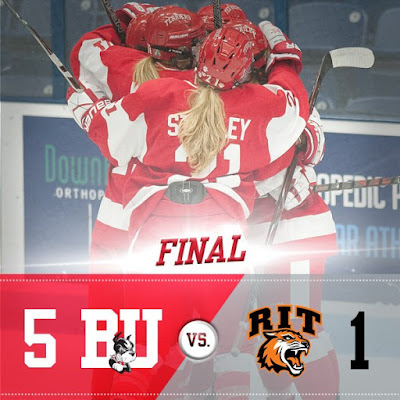 A late second period goal by the Tigers was matched in the third by Captain Rebecca Leslie for the 5-1 final. Freshman goalie Corrine Schroeder turned aside 19 of 20 RIT shots for her second win. The teams meet again on Saturday with puck drop at WBA at 3 p.m.